According to a survey commissioned by AdRoll, more than 90% of marketers believe remarketing is as effective or more effective than email marketing, display ads, and even paid search. But ask many of the same people what retargeting is, and they’ll tell you about Google’s remarketing campaigns – the kind that cookies a user and serves him or her Google Display Network ads for the next 30 days. While that’s certainly a great example, it’s only a small portion of what you can accomplish with retargeting campaigns, which for our purposes means serving an ad to a specific group of people based on their past web-browsing behaviors. The image to the right, for example, features two Facebook retargeting ads recently served to an unnamed Ripen employee with a self-described ecommerce addiction. In this post, we’ll explore the strategies you can use to find and target shoppers as well as the different ad types and companies that exist to help you build retargeting campaigns. We’ll also touch on how you can measure retargeting campaigns once they’re live. Audience retargeting is based on your users’ browsing habits – where they’ve been and what they’ve seen. It allows you to follow your visitors after they leave your site. Example: Customer A decides to do some “window shopping” on Nordstrom’s website for her beau’s upcoming birthday. She likes several pieces of apparel, but for some reason she isn’t ready to commit, so she leaves the site without making a purchase. 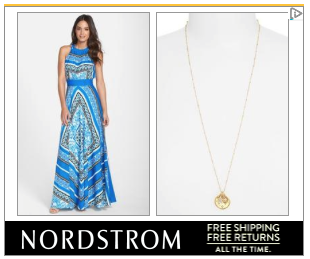 Nordstrom ads suddenly start appearing elsewhere on the web, cleverly touting the company’s incredible shipping and return policy. Of course, it can get more complicated when you start combining audiences and designing rules for how they intersect – though most platforms support this type of Boolean logic. For instance, a common target for ecommerce companies is someone who has been to your site in the last 30 days, but has not been to the thank you page of your checkout. These are site visitors, but not buyers, and are therefore a segment of special interest to keen marketers. 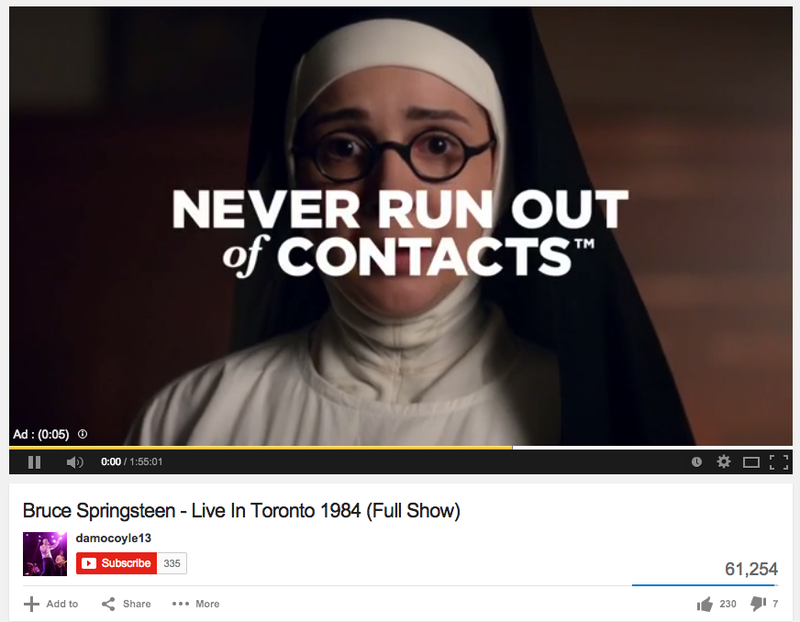 Best uses: Audience retargeting is incredibly versatile. Since the audience you’re tagging is typically your own, you can create any audience segment you want. Want to target shoppers of a given product category or someone who’s been to your clearance section? Just drop a tag on each page. The simplicity of audience targeting also means it has the broadest support of ad types (more on that later). Don’t feel confined to the typical leaderboard ad or Google text ad – there’s much more you can do with audience retargeting. Funnel position: Since you’re reaching people who are already actively browsing your site, you’re at the bottom of the funnel. 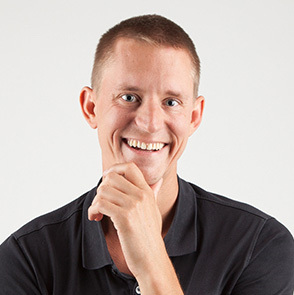 Use this channel to convert customers instead of trying to attract new ones. Where you can buy it: This is the most basic form of retargeting, so you can get it almost anywhere. You can go directly through Google AdWords, or you can opt to work with several other vendors, including AdRoll or ReTargeter, to gain access to a larger display network. You can use audience retargeting to tag your buyers, but this limits you to your own shoppers. What if you could speak to people who have purchased products like yours on other websites? Transactional retargeting makes it a reality. Example: Customer B — we’ll call him Dave — purchases an expensive piece of jewelry during the holiday season and uses PayPal to complete the transaction. 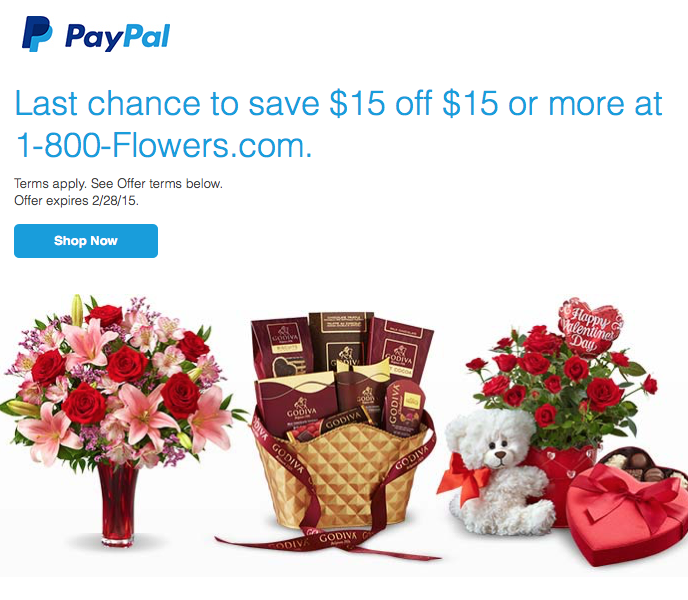 Two days before Valentine’s Day, he’s included on an eBlast from PayPal for a dozen roses from 1-800-Flowers. Where the data comes from: The data collection method varies greatly by source. One example is PayPal, which has a payment platform connected to verified email accounts. Avid PayPal users generate a great deal of data around what they’ve bought (and what they’re most likely to buy) whenever they complete an online purchase. Best uses: Find shoppers who buy products similar to yours or whose shopping habits indicate a potential interest in your products. Funnel position: Here you’ll be at the top of the funnel, attracting and acquiring new customers. Where you can buy it: PayPal offers a variety of ways to reach shoppers, including display advertising and email campaigns. Keep in mind, however, that its media purchases are done as insertion orders with five-figure price tags. PayPal typically works with larger advertisers, leveraging its extremely valuable data to fuel reach a very sizable customer base. OwnerIQ is another option; this advertising platform makes it possible for retailers and brands to share data. This can include audience retargeting (down to products they viewed on a site) as well as post-purchase targeting (transactional retargeting). Just as with “normal” search-based advertising, search retargeting leverages the value derived from users’ assumed interests and intent while they surf the web. Example: Customer C searches for “men’s suits,” stumbles around the internet for a few minutes, and gets distracted and leaves. A few days later, Men’s Warehouse – a brand that Customer A hadn’t come across during his search – starts serving ads based on his previous query across the web. Where the data comes from: Search retargeting is a way to retarget users based on searches they’ve performed online. While Google is practically synonymous with search, most search retargeting data comes from publishers that can track inbound search terms (for example, Bing), as well as various publishers’ on-site search data. Best uses: The data of search coupled with the vast reach of display advertising offers an alluring combination for smart marketers. That said, it can be devilishly tricky to get all the moving parts working together, which is why the three major providers of search retargeting (see below) all provide a full-service product (with required minimum campaign spend). Funnel position: Search retargeting is best for attracting attention and customer acquisition, so this option also sits at the top of the funnel. It can aid in retention, but it’s not the most efficient way to target existing customers. Where you can buy it: Search retargeting is available through real time bidding platforms that partner with data providers. Simplifi, Chango, and Magnetic are three prominent examples. Rich media (significantly limited inventory) As a highly established medium, display ads follow some pretty common specs and have tons of programmatic inventories throughout the web. You can use them in conjunction with any of the retargeting methods described above. Where you can buy them: Any platform that offers retargeting options will have display ads inventory. The only real exceptions are publisher-specific platforms, like Facebook or Twitter. 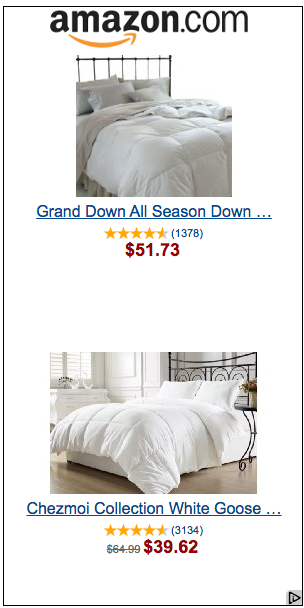 Below are various banner sizes available on the Google Display Network. Some ads are shown significantly more than others simply because more publishers accept the format. In the chart below, Wordstream has broken down the potential reach for each ad size on the Google Display Network. 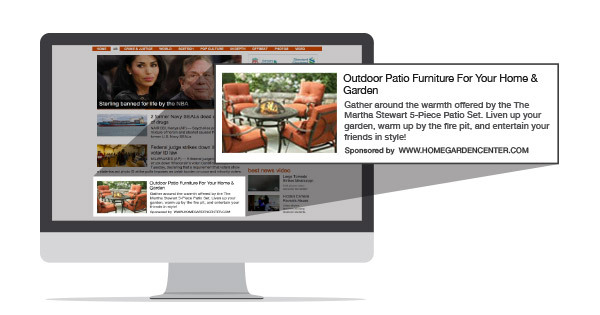 What they are: Dynamic ads are actually a type of display ad with a key difference. They use the capabilities of Flash or HTML5, a second cookie, and your store’s database to serve tailored ads based on a visitor’s individual browsing history. 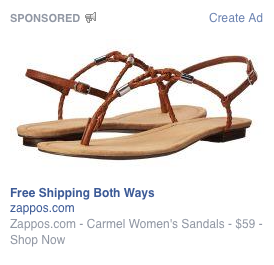 For example, instead of a general retargeting display ad for Zappos, a previous site visitor would see an ad with the exact pair of shoes he or she was just considering (or in this case, the exact pair of Birkenstocks with several similar options). Track the products (or product categories) a user interacts with. Value each interaction and determine the most relevant data point (for instance, weighing a user’s history of product views, items in cart, and purchased products to determine the most relevant ad). Then, when the ad is served, populate the ad in real time with the appropriate product(s). It’s worth noting that some advertisers accomplish a similar level of personalization by manually segmenting their other retargeting efforts. 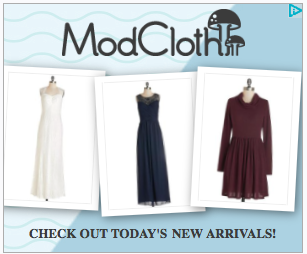 For example, ModCloth could tag “dresses” with a retargeting pixel and serve ads featuring products from that category to anyone with that particular cookie. However, this method isn’t truly dynamic because the ads won’t necessarily feature the exact product(s) a user was considering. But it is does help make ads more relevant and can usually be accomplished with less ad spend. Where you can buy them: You can buy dynamic ads anywhere you can buy a display ad with Flash or HTML5 capabilities. They’re available through the Google Display Network, but, as with any display ad, the inventory is entirely dependent on the number of publishers willing to host these ads. Google offers an out-of-the-box solution that makes it relatively easy for retailers to implement on their sites. What they are: Retargeting text ads are just what they sound like. They’re simple, text-based placements that can appear anywhere display ads are shown as well as other niche online locations. (You may have noticed them in your Gmail sidebar.) They don’t stand out as much as banners, but they do give you more room for detailed messaging. 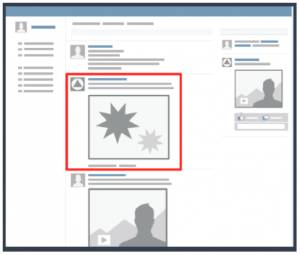 What they are: Facebook’s “custom audience” feature offers a retargeting solution. 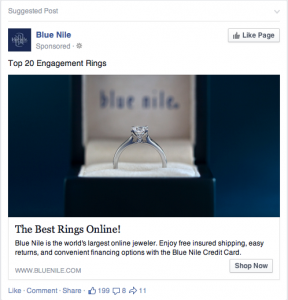 Shown in both the sidebar and news feed, Facebook ads have great engagement potential and perform better than you might expect. The second “custom audience” drops a pixel on anyone who visits your site (and later serves them your ads on the social media network). Facebook ads do come with certain drawbacks. First, you won’t be able to (and shouldn’t) try to re-use creative from standard banner or text campaigns. Second, a custom audience with email addresses will follow users from one device to another, whereas a retargeting/pixel “custom audience” is tied to a user’s search history and not their account. 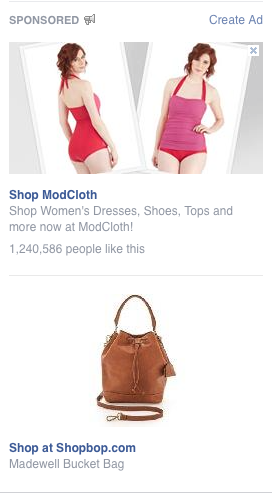 Still, Facebook’s very nature makes sophisticated retargeting campaigns possible. For example, let’s say a young man goes in search for an engagement ring on Blue Nile, and he’s listed as “in a relationship” on Facebook. Hypothetically, he could be served Facebook retargeting ads from Blue Nile’s marketing team morning, noon, and night until just after he either completes a check out on the Blue Nile website or his relationship status changes to “engaged.” That’s some pretty powerful, highly targeted messaging. Hypothetically. Where you can buy them: If your ads don’t require any data from Facebook or social interaction, they can be purchased through third party vendors (e.g. PerfectAudience). If they do include social data or actions, your campaign must be purchased through Facebook. For example, if you want to retarget people who have visited your site with a newsfeed offer for free shipping, you can go through a third party vendor. But if you want to target 18 to 35-year olds who are fans of a certain page, you will need to purchase an ad through Facebook’s platform. Why go third party? These vendors provide greater control over things like how many times a given user sees an ad over a time period. You’ll also benefit from consolidating all your retargeting to one platform when it comes to measuring your campaigns. That being said, as Facebook’s ad platform has become more sophisticated, the need for third party vendors has decreased. These ads are limited by the character and content constraints of Twitter, but benefit by being interactive (available for retweets, replies, and favorites) just like a normal tweet. They’re best used to gain Twitter followers, drive social interactions, or push traffic back to your website via a direct link. 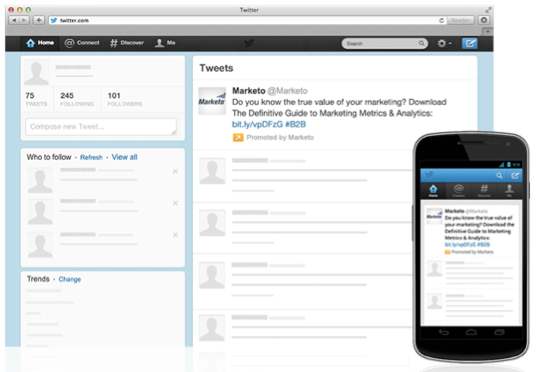 Where you can buy them: Twitter placements can be purchased through… Twitter. To date, there isn’t a true Twitter ad exchange, though some third-party platforms, like AdRoll and Retargeter, may be easier to use. What they are: Most video-retargeting inventory is made up of 15 second pre-roll ads. These brief commercials are shown before a video plays, drawing impressions while users wait for their content. On YouTube, these take the form of TrueView pre-rolls that allow users to skip the ad after the first 5 seconds have played. Where you can buy them: YouTube and Brightcove video retargeting are available through real-time bidding platforms (like Simpli.fi). 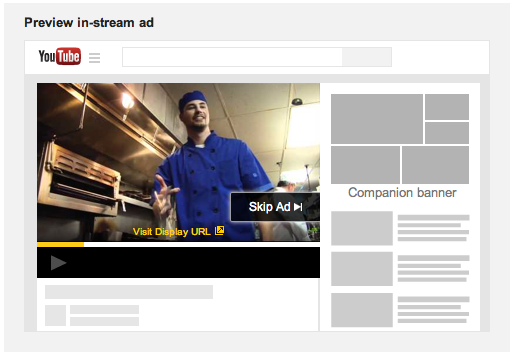 YouTube ads are also available through AdWords; in fact, you can even use the same remarketing lists you’re using for other AdWords display or search campaigns. What they are: While Google’s Remarketing Lists In Search Ads (RLSA) are technically a form of text advertising, they deserve their own section because the application is very different. They also offer two very powerful advertising opportunities. First is the functionality to target text-based ads only to Google searchers who have visited your website before. This may not seem earth shattering, but the service allows marketers to target search terms that would not be profitable outside of this context. For example, bidding on all searches of “spring outfits” may not normally be worthwhile for your plus-size clothing store. But with RLSA, you can target (only) visitors who have actually been to your website and are actively looking for springtime apparel. The second functionality enabled by RLSA is a remarketing-based bid modification. Let’s say you’re bidding conservatively for “boy’s bathing suits” because you’re far from dominating the market. With RLSA’s flexibility, you can increase your bid to get in front of searchers who have already been to your site. As a result, you can target customers who are more likely to give you a chance without draining your AdWords campaign budget on search engine users that aren’t familiar with your brand. Where you can buy them: Both features of RLSA are exclusive to AdWords, so you’ll have to go directly to Google if you want to try them out. What they are Native ads are designed to look exactly like a publisher’s normal content; from the general styling to the in-line placement of an image, copy block, or video, these ads stand out by blending in. With their guards down and a (hopefully) relevant retargeting message in front of them, users are more likely to click through on your product or offer. Unlike your typical analytics suite, most retargeting services claim credit for everything that goes through their platform. If they see activity and then a conversion, they will report it as their own. But the very nature of retargeting means you’re dealing with complex user journeys, and with more complex user journeys, it’s a really bad idea to silo data in a way that keeps related data independent from one another. A user clicks an ad and some time in the next 30 days, they complete a conversion on the website. The conversion is almost always attributed to the last ad in that platform the user clicked prior to the conversion. But any number of interactions with ads from other platforms or channels may have influenced that decision; click-through tracking does not take that into consideration. Early Day 1: The user searches for “suits” on Google and clicks your paid search ad. Late Day 1: The user browses around for a while, then gets distracted and leaves. 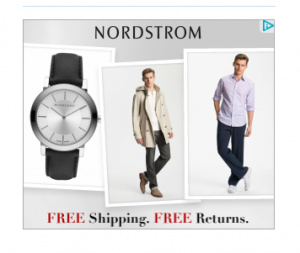 Day 4: The user sees a retargeting ad that you’re serving through Adroll for Brooks Brothers and clicks on it. This time, he puts something in his shopping cart, but thinks it’s a little too pricey. Day 8: That weekend Brooks Brothers sends out an email with a 15% offer. The user clicks through and buys. Who’s right? All of them, to a degree – they each contributed something to the sale, and hanging your hat on any single touchpoint would be foolish. But just saying that doesn’t make it any easier for marketers to follow a user’s precise path to conversion, especially with more complex campaigns. Is there actually a way to sort out which efforts worked – and which didn’t? This problem of multi-channel attribution can be an enormous chore or a fun mental exercise, depending on your disposition. It’s important to have strong data from each system so you can improve the performance of every channel. Third party analytics suites like Google Analytics and multichannel reporting can offer critical insight into where users engaged and (to some extent) why. I also highly recommend reading Avinash Kaushik’ book on web analytics – it’s a fantastic place to start for any marketer with lots of data to comb through. Similar to a click-through conversion, a view-through conversion tracks sales (or any kind of a conversion) that occur within 30 days of seeing an ad. Since this kind of data doesn’t imply the user ever clicked an ad, it’s making a pretty big assumption that viewing the ad resulted in driving the user back to the site to purchase. There’s a lot of ambiguity here – certainly an ad has some effect. Many platforms approach this issue by allowing you to choose a percentage of view-through conversions to count. In principle it’s a good idea, but it usually winds up being a totally arbitrary percentage. Despite the difficulty of measuring view-through conversions, they remain an important metric in evaluating large-scale display campaigns. According to a report from comScore, only 8% of internet users account for 85% of all clicks. This means click-through conversions alone cannot account for the success of a display marketing campaign. Until you factor both types of conversion into your analysis, you’ll always be missing a major piece of the puzzle. If there’s one thing marketers should take away from this piece, it’s that the tools they need to run a successful retargeting campaign are already out there. In just a few years, retargeting has gone from a relatively new concept to a robust space with room for text, display, and video campaigns across a broad number of sites and services. With so many options, marketers can target potential customers at key moments with personal, relevant, and enticing offers. It’s just a matter of doing your homework, implementing the campaign, and making meaningful changes based on your unique data. So don’t wait – get planning!